We are proud that Linden Lane Interiors was named First Runner Up in Interior Design in the Best of Cville. Thank you to all our clients and supporters for this honor! Linden Lane is Charlottesville's premier home furnishings shop and interior design firm. In our store on West Main Street, we offer you a curated collection of unique and gorgeous items to enhance your home: furniture, lighting, art, antiques, and giftware. We also provide a full range of interior design services, from in-home consultation to full scale projects that meet all budgets. While searching for these treasures from near and far is fun for us, even more enjoyment comes from being able to share them with you, knowing they will fill your life with pleasure and comfort. You will find a sophisticated blend of old and new in wonderfully designed vignettes meant to please and inspire. We invite you to visit our store to experience the elements of gracious living and unparalleled customer service. Join our list to receive invitations to special events and promotions. 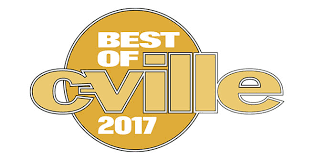 We are proud that Linden Lane Interiors was named First Runner Up for Interior Design in the Best of Cville 2017!